hierarchyName – String. The name of the hierarchy to which the sorting is applied. sortType – String. 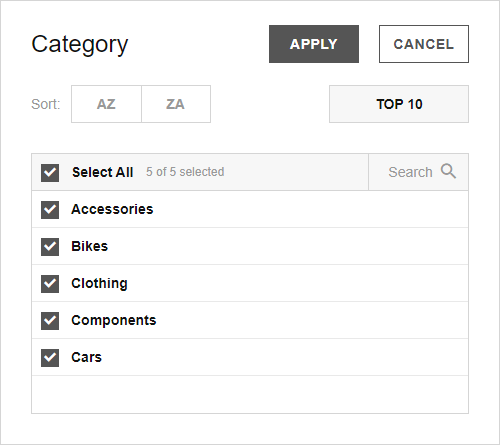 The following sorting types can be applied: "asc", "desc", or "unsorted". hierarchyName – String. The unique name of the hierarchy to which the sorting is applied. compareFunction – Function. Defines the sort order. The input parameters are the same as for the compareFunction of the Array.sort() method. 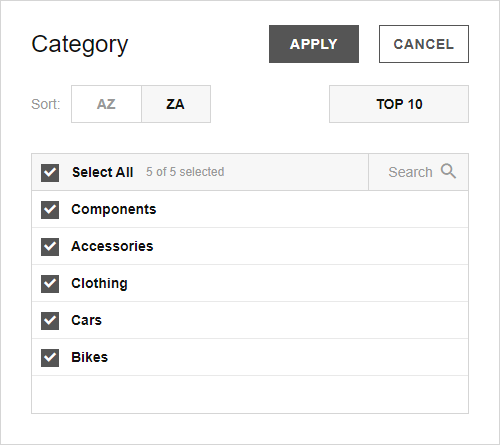 Adding a custom sorting function is used to override the default alphabetical order. For example, you can make sure that some members are always kept at the end or at the start of the list. Custom sorting for JSON, CSV, and OCSV data sources can be set via the sortOrder array. This property can be specified like so: ["member_1", "member_2", etc.]. 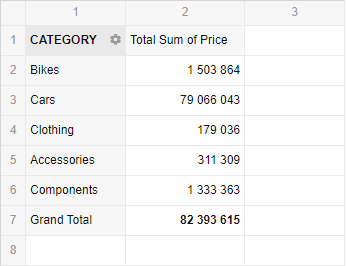 Custom sorting is an easy way to predefine your own order for columns, rows, or report filters in the slice.